LPWAN technologies such as NB-IoT, Sigfox, and LoRa deliver low power, long range communication at low bitrate and can be used for asset tracking, environmental monitoring, water & electricity meters, and so on. The line-of-sight range between the closest gateway and nodes is usually 10 to 20 km, and coverage can be expanded by connecting several gateways to form a network. However, this is not workable in all locations worldwide, so Sigfox plans to launch a Sigfox satellite in collaboration with Eutelsat in order to provide coverage in places like large deserts such as the Sahara desert, the two poles, as well as oceans as explained by Franck Siegel, chief operating officer at Sigfox. This will for instance enable tracking and monitoring of oil platforms and vessels. The press release does not explains much except Sigfox and Eutelsat will test the first Satellite in H2 2019 before the commercial launch of the “ELO” constellation in 2020. Eutelsat Communications has commissioned a nano-satellite from manufacturer Tyvak International SRL, a subsidiary of Terran Orbital Corporation, a leading aerospace provider of nanosatellite and microsatellite vehicles and services. 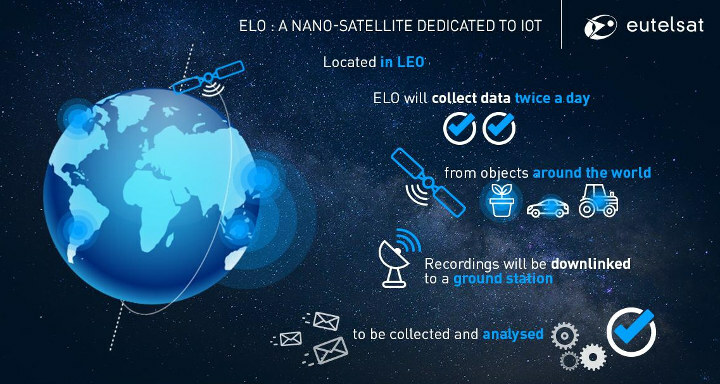 Eutelsat LEO for Objects (ELO) will be used to assess the performance of low earth orbit (LEO) satellites in providing narrowband connectivity for objects. The satellite operator will be drawing on the technology of Sigfox, which runs a unique global narrowband network dedicated to the IoT. Low Earth Orbit satellites rotate at around the earth at around 500-600 km altitude. The Sigfox satellite will collect data twice daily from connected objects across the globe equipped with the same omnidirectional antennas already used by terrestrial IoT networks, and data will then be transmitted daily to a ground station located on Svalbard, a Norwegian archipelago in the Arctic Ocean, so that it can be analyzed later on. Iridium is already doing similar thing. And they have completed their constellation a month ago. As an ex-Motorolan who worked next door to the Iridium people, I find the fact that they’re still going both impressive and disturbing. So, they finally have 77 satellites in orbit? Should I stop calling them Dysprosium? They’ve got a full replacement constellation of 75 in place (Iridium-NEXT) now. SpaceX just recently finished chucking them all in orbit for them this January.